I've noticed that some of you have been posting some science news articles and I thought it might be a good idea to collate them all in one thread......so, if you see anything that you feel is of interest to the site then please feel free to add them here. When you do, please credit the source. going through these pages im constantly reminded of just how small and insignificant we really are,like a speck of dust in the vastness of space. Gone does not necessarily mean forgotten, especially in biology. A recent finding by researchers at the University of Wisconsin, Madison, and colleagues from the University of Manchester have found new evidence that the ability to form previously lost organs--in this case, teeth--can be maintained millions of years after the last known ancestor possessed them. i got a couple of birds next door that make teeth,they work for the dentist i said about,ones quite nice,called wendy. In the conventional view, the earliest mammals were small, primitive, shrewlike creatures that did not begin to explore the world's varied environments until the dinosaurs died out 65 million years ago. Scientists have found a fossil of a mammal — part beaver, part otter, part platypus — that lived in China 164 million years ago. The extinct species appears to have been an amalgam of animals. It had a broad, scaly tail, flat like a beaver's. Its sharp teeth seemed ideal for eating fish, like an otter's. Its likely lifestyle — burrowing in tunnels on shore and dog-paddling in water — reminds scientists of the modern platypus. Its skeleton suggests that it was about 20 inches long, from snout to the tip of its tail, about the length of a small house cat. The surprising discovery, made in 2004 in the abundant fossil beds of Liaoning Province, China, is being reported in the journal Science by an international team led by Ji Qiang of Nanjing University. In the article, Dr. Ji and other researchers from the Chinese Academy of Geological Sciences in Beijing and the Carnegie Museum of Natural History in Pittsburgh said the fossil skeleton showed that some mammals occupied more diverse ecological niches than had been suspected in the Jurassic Period, an age dominated by dinosaurs. Thomas Martin, an authority on early mammals at Senckenberg Research Institute in Frankfurt, said the find pushed back "the mammalian conquest of the waters by more than 100 million years" and "impressively contradicts" the conventional view. "This exciting fossil," he wrote in a commentary accompanying the report, "is a further jigsaw puzzle piece in a series of recent discoveries, demonstrating that the diversity and early evolutionary history of mammals were much more complex than perceived less than a decade ago." Despite similarities with some modern animals, the Jurassic mammal has no modern descendants and is not related to any existing species. 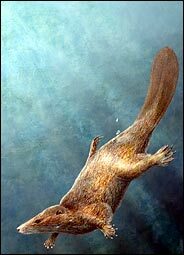 The discoverers have given it the name Castorocauda lutrasimilis, Latin for beaver tail and similarity to the otter. Zhe-Xi Luo, one of the discoverers and the curator of vertebrate paleontology at the Carnegie museum, said the specimen was well preserved, unlike the surviving fragments of bone and tooth of most mammals from the dinosaur age. The skeleton is accompanied by fur and scale imprints and the suggestion of soft-tissue webbing in the hind limbs. Dr. Luo said the fur was to keep water from the animal's skin. It is the most primitive known mammal to be preserved with hair, evidence for its evolution before the appearance of more complex mammals. The scientists said the tail and limbs of the newfound specimen were well developed for aquatic life. They surmised that like the platypus, Castorocauda swam in rivers and lakes, ate aquatic animals and insects and built nests in burrows along the shore. The animal had molars specialized for feeding on small fish and small aquatic invertebrates. "So far, it is the only semiaquatic mammal from the Jurassic," Dr. Luo said. The skeleton was found by peasants in Liaoning, the province in northeast China that in recent years has produced several notable discoveries of mammal diversity. The semiaquatic mammal was uncovered in the same hilly country where paleontologists have collected fossils of feathered dinosaurs and two 130-million-year-old animals that did not fit the lowly image of mammals of that period. One of them, the size of an opossum, had feasted on a small dinosaur just before dying. Jin Meng of the American Museum of Natural History in Manhattan, one of the discoverers of previous Liaoning mammals but who was not involved in the most recent one, said in a telephone interview that more than a dozen new mammals from that area had recently produced "real evidence to show the diversity of lifestyles and behaviors of mammals" in the age of dinosaurs. "We have been seeing mammals at that time that were larger than a mouse or rat, some that climbed trees, and now we see some that could swim in water," Dr. Meng said. Thank you for your contribution Ariel. please continue, your posts are welcome. ATHENS (AFP) - Its austere white is on every postcard, but the Athens Parthenon was originally daubed with red, blue and green, the Greek archaeologist supervising conservation work on the 2,400-year-old temple said. Archaeologists have been trying since 1987 to remedy damage wrought on the Parthenon's marble structure by centuries of weather exposure and decades of smog pollution. Principal restoration work on the entire Acropolis citadel, which stands in the centre of the modern Greek capital, is scheduled to be completed by 2009. Dedicated to the ancient Greek goddess Athena, patron of the ancient city of Athens, the Parthenon was badly damaged during a Venetian siege of occupying Ottoman Turkish forces in 1687. Much of the temple's eastern frieze was removed in the early 19th century by agents of Lord Elgin, then British ambassador to the Ottoman Empire. Lord Elgin bought the Elgin marbles from the Turkish government, who had legal jurisdiction over Greece at the time (by right of conquest). The fact that after the Greeks successfully rebelled against their Turkish overlords (facilitated by the general state of collapse of the Ottoman empire, and European support for Greek 'terrorist' activity) they then declared the sale illegal after the fact is something else. (and, yes, I am being deliberately provocative – simple saying there are two sides to every story). The housing of the marbles in the British Museum has been a mixed blessing. While the artifacts held in London, unlike those on the Parthenon, have been saved from the hazards of the elements, they have also been irrevocably damaged by the "cleaning" methods employed by the British Museum in the 1930s. Acting under the erroneous belief that the marbles were originally bright white, the marbles were cleaned with metal tools and caustics, causing serious damage and altering the marbles' coloring. (The Pentelicon marble on which the carvings were made naturally acquire a tan color similar to honey when exposed to air.) In addition, the process scraped away all traces of surface coloring that the marbles originally held. As such, the marbles in both locations have suffered: while the marbles of the Parthenon have been damaged by weather, the ones held in Britain have been damaged by faulty methods. Scientists at The University of Manchester and the Manchester Metropolitan University have carried out the first comparative scientific study of ancient spiders trapped in amber more than 30 millions years ago. The study of fossilised spiders from the Baltic (Poland) and the Dominican (Caribbean) regions has revealed new insights into the ecologies of spiders dating back to the Cenozoic period. It is the first time ancient spiders from different parts of the world have been compared on such a large scale. 671 species of spiders were compared in the study which is published in the March issue of the Royal Society's Journal Biology Letters. Palaeoarachnologist Dr David Penney, of The University of Manchester's School of Earth, Atmospheric and Environmental Sciences who led the research, said: "Amber provides a unique window into past forest ecosystems. It retains an incredible amount of information, not just about the spiders themselves, but also about the environment in which they lived. "We have not only been able to compare the size distributions of over 600 spiders but we have also been able to gain unique insights into the forest in which they lived." By analysing the size distributions of the spiders and comparing the distinct hunting traits of each species, Dr Penney found that web-spinning spiders were bigger in Baltic amber than in Dominican amber, but that there was no difference between hunting spiders in either region. It was also found the fauna of the amber producing trees in each region accounted for this difference in size. "Several lines of evidence show that greater structural complexity of Baltic compared to Dominican amber trees explains the presence of larger web-spinners. The Dominican trees are long, thin and smooth whereas the Baltic trees are wide and bushy, providing a much better environment for web-spinners to prosper," says Dr Penney. The study demonstrates for the first time that spiders trapped in amber can be scientifically compared across deep time (30 million years). This is due to the fact that until now it was unknown whether the amber resins were trapping organisms uniformly. This study proves they were. 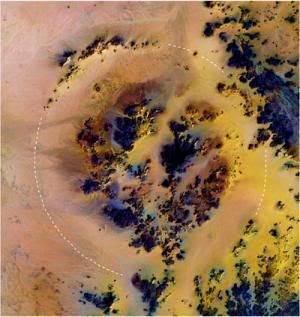 Researchers from Boston University have discovered the remnants of the largest crater of the Great Sahara of North Africa, which may have been formed by a meteorite impact tens of millions of years ago. Dr. Farouk El-Baz made the discovery while studying satellite images of the Western Desert of Egypt with his colleague, Dr. Eman Ghoneim, at BU's Center for Remote Sensing. The researchers also found evidence that Kebira suffered significant water and wind erosion which may have helped keep its features unrecognizable to others. “The courses of two ancient rivers run through it from the east and west,” added Ghoneim. The terrain in which the crater resides is composed of 100 million year-old sandstone – the same material that lies under much of the eastern Sahara. The researchers hope that field investigations and samples of the host rock will help in determining the exact age of the crater and its surroundings. Kebira's shape is reminiscent of the many double-ringed craters on the Moon, which Dr. El-Baz remembers from his years of work with the Apollo program. Because of this, he believes the crater will figure prominently in future research in comparative planetology. And, since its shape points to an origin of extraterrestrial impact, it will likely prove to be the event responsible for the extensive field of “Desert Glass” – yellow-green silica glass fragments found on the desert surface between the giant dunes of the Great Sand Sea in southwestern Egypt. Dr. El-Baz is research professor and Director of the Center for Remote Sensing at Boston University. He is a renowned geologist who over the past 30 years has conducted studies in all the major deserts of the world. He is a member of the U.S. National Academy of Engineering and a Fellow of the American Association for the Advancement of Sciences and the Geological Society of America. The latter established the “Farouk El-Baz Award for Desert Research” to reward excellence in arid land studies. Dr. Eman Ghoneim is a research associate at the Center for Remote Sensing. She is an expert in hydrological modeling and now conducts research on arid land geomorphology with emphasis on groundwater concentration under the direction of Dr. El-Baz. Founded in 1839, Boston University is an internationally recognized institution of higher education and research. With more than 30,000 students, it is the fourth largest independent university in the United States. BU contains 17 colleges and schools along with a number of multi-disciplinary centers and institutes, which are central to the school’s research and teaching mission. Thanks JimBob...excellent post...keep em coming ! Oh come on, no way is that 1st pic a beaver. Any fool can see the difference! This is an article which the esteemed DoctorBeaver posted as a separate thread..I thought it would be good here too..thanks Doctor Castor Fiber !! DARPA (Defense Advanced Research Project Agency) has taken another page from science fiction writer William Gibson's book by creating a neural implant to enable engineers to remotely manipulate a shark's brain signals. This would eventually allow them to control the animal's movements and possibly decode their perceptions. Given that sharks have senses that humans don't have (like the ability to sense electromagnetic fields), it could open up some interesting uses. The implant consists of multi-channel neural ensemble readers and stimulators, diverse controllers and sensors. In addition, the DARPA researchers want to use their setup to detect and decipher the neural patterns that correspond to shark activities like sensing an ocean current, a particular scent in the water or an electrical field. If they can succeed in these experiments, it might be possible to control a free-swimming shark; it could be trained to track enemy ships or submarines, or to detect underwater mines or cables. In his 1981 short story Johnny Mnemonic, author William Gibson wrote about Jones, a military surplus dolphin cyborg that has equipment that is surprisingly similar to the DARPA sharks. Of course, there is only so much you can do with a friendly dolphin. Maybe that's why DARPA's military sponsors have chosen sharks. Take a look at these related stories about scientists who have used implants to 'jack' into a cat's brain to see what the cat is seeing, or other researchers who have implanted RFID chips in birds to warn of Avian flu. It came from the edge of the visible universe, the most distant explosion ever detected. In this week's issue of Nature, scientists at Penn State University and their U.S. and European colleagues discuss how this explosion, detected on 4 September 2005, was the result of a massive star collapsing into a black hole. The explosion, called a gamma-ray burst, comes from an era soon after stars and galaxies first formed, about 500 million to 1 billion years after the Big Bang. The universe is now 13.7 billion years old, so the September burst serves as a probe to study the conditions of the early universe. "This was a massive star that lived fast and died young," said David Burrows, senior scientist and professor of astronomy and astrophysics at Penn State, a co-author on one of the three reports about this explosion published this week in Nature. "This star was probably quite different from the kind we see today, the type that only could have existed in the early universe." The burst, named GRB 050904 after the date it was spotted, was detected by NASA's Swift satellite, which is operated by Penn State. Swift provided the burst coordinates so that other satellites and ground-based telescopes could observe the burst. Bursts typically last only 10 seconds, but the afterglow will linger for a few days. GRB 050904 originated 13 billion light years from Earth, which means it occurred 13 billion years ago, for it took that long for the light to reach us. Scientists have detected only a few objects more than 12 billion light years away, so the burst is extremely important in understanding the universe beyond the reach of the largest telescopes. "Because the burst was brighter than a billion suns, many telescopes could study it even from such a huge distance," said Burrows, whose analysis focuses mainly on Swift data from its three telescopes, covering a range of gamma-rays, X-rays, and ultraviolet/optical wavelengths, respectively. Burrows is the lead scientist for Swift's X-ray telescope. The Swift team found several unique features in GRB 050904. The burst was long, lasting about 500 seconds; and the tail end of the burst exhibited multiple flares. These characteristics imply that the newly created black hole didn't form instantly, as some scientists have thought, but rather it was a longer, chaotic event. Closer gamma-ray bursts do not have as much flaring, implying that the earliest black holes may have formed differently from ones in the modern era, Burrows said. The difference could be because the first stars were more massive than modern stars. Or, it could be the result of the environment of the early universe when the first stars began to convert hydrogen and helium (created in the Big Bang) into heavier elements. GRB 050904, in fact, shows hints of newly minted heavier elements, according to data from ground-based telescopes. This discovery is the subject of a second Nature article by a Japanese group led by Nobuyuki Kawai at the Tokyo Institute of Technology. GRB 050904 also exhibited time dilation, a result of the vast expansion of the universe during the 13 billion years that it took the light to reach us on Earth. This dilation results in the light appearing much redder than when it was emitted in the burst, and it also alters our perception of time as compared to the burst's internal clock. These factors worked in the scientists' favor. The Penn State team turned Swift's instruments onto the burst about 2 minutes after the event began. The burst, however, was evolving as if it were in slow-motion and was only about 23 seconds into the bursting. So scientists could see the burst at a very early stage. Only one quasar has been discovered at a greater distance. Yet, whereas quasars are supermassive black holes containing the mass of billions of stars, this burst comes from a single star. The detection of GRB 050904 confirms that massive stars mingled with the oldest quasars. It also confirms that even more distant star explosions -- perhaps from the first stars, theorists say--can be studied through a combination of observations with Swift and other world-class telescopes. "We designed Swift to look for faint bursts coming from the edge of the universe," said Neil Gehrels of NASA Goddard Space Flight Center in Greenbelt, Md., Swift's principal investigator. "Now we've got one and it's fascinating. For the first time we can learn about individual stars from near the beginning of time. There are surely many more out there." Swift was launched in November 2004 and was fully operational by January 2005. Swift carries three main instruments: the Burst Alert Telescope, the X-ray Telescope, and the Ultraviolet/Optical Telescope. Swift's gamma-ray detector, the Burst Alert Telescope, provides the rapid initial location and was built primarily by the NASA Goddard Space Flight Center in Greenbelt and Los Alamos National Laboratory and constructed at GSFC. Swift's X-Ray Telescope and UV/Optical Telescope were developed and built by international teams led by Penn State and drew heavily on each institution's experience with previous space missions. The X-ray Telescope resulted from Penn State's collaboration with the University of Leicester in England and the Brera Astronomical Observatory in Italy. The Ultraviolet/Optical Telescope resulted from Penn State's collaboration with the Mullard Space Science Laboratory of the University College-London. These three telescopes give Swift the ability to do almost immediate follow-up observations of most gamma-ray bursts because Swift can rotate so quickly to point toward the source of the gamma-ray signal. The idea that meteorite impacts caused mass extinctions has been in vogue over the last 25 years, since Louis Alverez’s research team in Berkeley, California published their work about an extraterrestrial iridium anomaly found in 65-million-year-old layers at the Cretaceous-Tertiary boundary. This anomaly only could be explained by an extraterrestrial source, a large meteorite, hitting the Earth and ultimately wiping the dinosaurs – and many other organisms - off the Earth’s surface. Flood basalt eruptions are – he says - an alternative kill mechanism. These do correspond with all main mass extinctions, within error of the techniques used to determine the age of the volcanism. Furthermore, they may have released enough greenhouse gases (SO2 and CO2) to dramatically change the climate. The largest flood basalts on Earth (Siberian Traps and Deccan Traps) coincide with the largest extinctions (end-Permian, and end-Cretaceous). “Pure coincidence?”, ask Saunders and Reichow. The Siberian Traps are the largest known continental flood basalt province. Erupted about 250 million years ago at high latitude in the northern hemisphere, they are one of many known flood basalts provinces - vast outpourings of lava that covered large areas of the Earth's surface. A major debate is underway concerning the origin of these provinces –including the Siberian Traps - and their environmental impact. Never mind tilting trains or the end of slam doors, British Rail once entertained hopes of transporting passengers by nuclear-powered "flying saucer'', it has emerged. Rail managers filed an application for a patent in December 1970 for a space vehicle powered by "controlled thermonuclear fusion reaction ignited by one or more pulsed laser beams''. The space vehicle, with its passenger compartment upstairs, like the pod of a jumbo jet, would have been cheap to run and super-fast, according to inventor Charles Osmond Frederick. The detailed plans, made on behalf of the British Railways Board, were found on the European Patent Office Web site with the patent granted in March 1973. A patent document reads: "The present invention relates to a space vehicle. More particularly it relates to a power supply for a space vehicle which offers a source of sustained thrust for the loss of a very small mass of fuel. The high-tech world envisaged by rail bosses failed to go further than the drawing board. The patent lapsed because of non-payment of renewal fees. Space experts dismissed the design as a pure science fiction and based on a fusion process that does not exist yet. Michel van Baal, of the European Space Agency in the Netherlands told The Times: "I have had a look at the plans and they don't look very serious to me at all." Astronomers have discovered a narrow stream of stars extending at least 45 degrees across the northern sky. The stream is about 76,000 light-years distant from Earth and forms a giant arc over the disk of the Milky Way galaxy. In the March issue of the Astrophysical Journal Letters, Carl Grillmair, an associate research scientist at the California Institute of Technology's Spitzer Science Center, and Roberta Johnson, a graduate student at California State University Long Beach, report on the discovery. "We were blown away by just how long this thing is," says Grillmair. "As one end of the stream clears the horizon this evening, the other will already be halfway up the sky." The stream begins just south of the bowl of the Big Dipper and continues in an almost straight line to a point about 12 degrees east of the bright star Arcturus in the constellation Bootes. The stream emanates from a cluster of about 50,000 stars known as NGC 5466. At some point, particularly when its orbit takes it close to the galactic center, the cluster can no longer hang onto its most outlying stars, and these stars drift off into orbits of their own. The lost stars that find themselves between the cluster and the galactic center begin to move slowly ahead of the cluster in its orbit, while the stars that drift outwards, away from the galactic center, fall slowly behind. Ocean tides are caused by exactly the same phenomenon, though in this case it's the difference in the moon's gravity from one side of Earth to the other that stretches the oceans. If the gravity at the surface of Earth were very much weaker, then the oceans would be pulled from the planet, just like the stars in NGC 5466's stream. Despite its size, the stream has never previously been seen because it is so completely overwhelmed by the vast sea of foreground stars that make up the disk of the Milky Way. Grillmair and Johnson found the stream by examining the colors and brightnesses of more than nine million stars in the Sloan Digital Sky Survey public database. "It turns out that, because they were all born at the same time and are situated at roughly the same distance, the stars in globular clusters have a fairly unique signature when you look at how their colors and brightnesses are distributed," says Grillmair. Using a technique called matched filtering, Grillmair and Johnson assigned to each star a probability that it might once have belonged to NGC 5466. By looking at the distribution of these probabilities across the sky, "the stream just sort of reached out and smacked us. "The new stream may be even longer than we know, as we are limited at the southern end by the extent of the currently available data," he adds. "Larger surveys in the future should be able to extend the known length of the stream substantially, possibly even right around the whole sky." The stars that make up the stream are much too faint to be seen by the unaided human eye. Owing to the vast distances involved, they are about three million times fainter than even the faintest stars that we can see on a clear night. Grillmair says that such discoveries are important for our understanding of what makes up the Milky Way galaxy. Like earthbound rivers, such tidal streams can tell us which way is "down," how steep is the slope, and where the mountains and valleys are located. By measuring the positions and velocities of the stars in these streams, astronomers hope to determine how much "dark matter" the Milky Way contains, and whether the dark matter is distributed smoothly, or in enormous orbiting chunks.